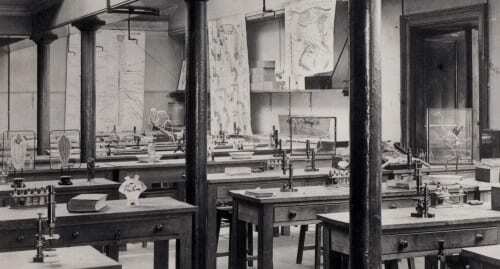 Lab set up for the ‘Longer Course in Practical Zoology’, UCL 1887. Lab with students. 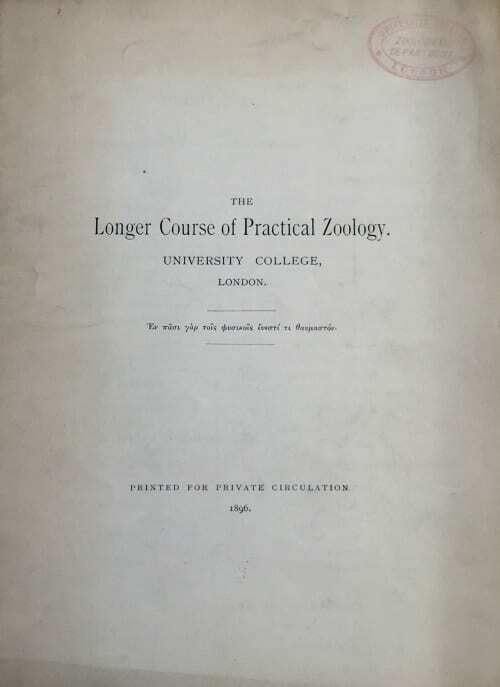 ‘Longer Course in Practical Zoology’, UCL 1887. 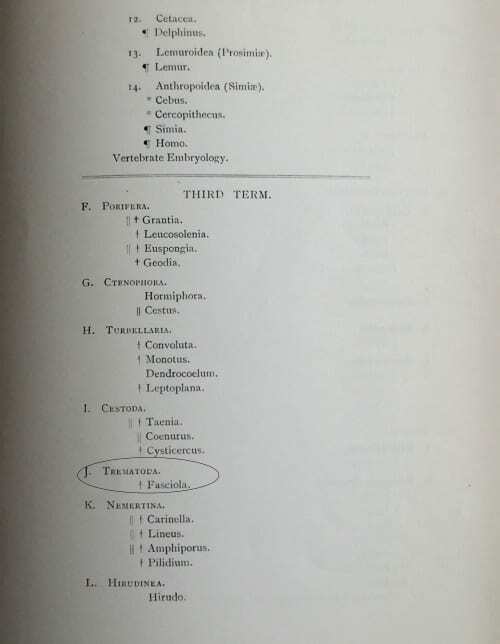 The class was the popular ‘Longer Course of Practical Zoology’ taught by E. Ray Lankester – the Museum’s curator, UCL’s chair of zoology, and all-around professor extraordinaire. 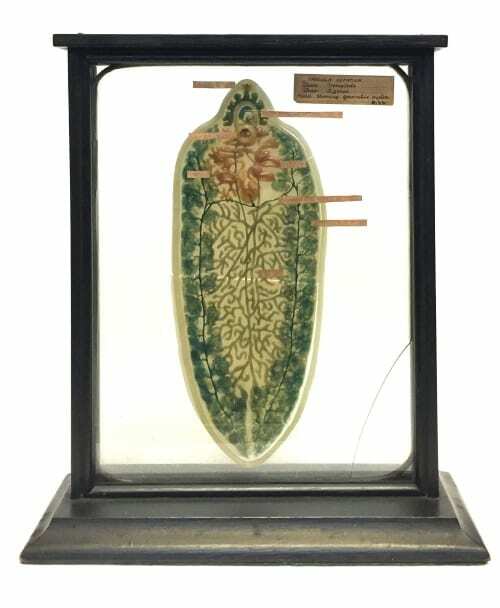 In both images, the wax model can been seen alongside its now-lost twin (D44 shows the generative system of F. hepatica; the second model showed the alimentary tract and nervous system). As pictured, the models are on their original stands and not the black protective frame which houses D44 today. 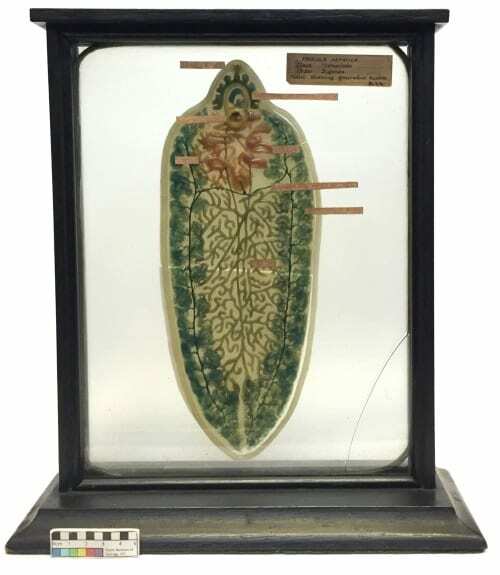 Among the microscopes and chart illustrations there are mounted skeletons and skulls as well as preserved specimens either in jars or in test tubes. 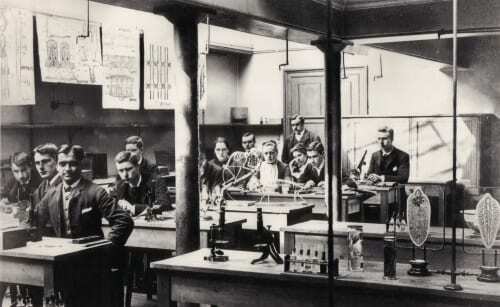 Here we have the zoological laboratory which Lankester developed and was to be the standard until the end of the First World War when genetics and biochemistry began to compete with anatomical studies 1. Amazingly, the Museum still has a copy of the course list for the ‘Longer Course’ in 1896. The specimens are listed under each of the three terms with D44 making its appearance in the third term. 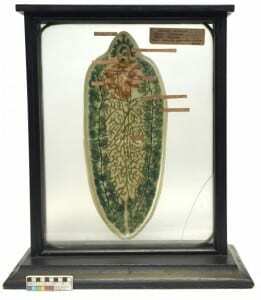 So why use model instead of a real specimen? While F. hepatica is a relatively large tapeworm (it can been seen with the naked eye), individual worms measure only 2.5 cm x 1.3 cm. The use of a model to show the small anatomical features of the tapeworm therefore makes it possible to overcome physical limitations. Lester, Joseph. 1995. E. Ray Lankester and the Making of Modern British Biology. British Society for the History of Science. Alden Press. Oxford. I am trying to find a photo of Florence Buchanan (UCL Zoology student from 1886 – 1890) and wondered whether it is known who the female students in these photos are? We are collating material for an exhibition of prestigious female contributors to the field of physiology and so far have had no luck sourcing an image of Florence, who was a notable physiologist at Oxford.